THIS RECENT ARRIVAL IN TO OUR STOCK IS A NISSAN QASHQAI 1.6 DCI TEKNA 4WD 130 BHP 5-DOOR 6-SPEED MANUAL, FINISHED IN BLADE SILVER METALLIC WHICH IS COMPLIMENTED BY A FULL BLACK LEATHER UPHOLSTERY. THERE HAVE BEEN THREE REGISTERED KEEPERS FROM NEW N& IT COMES COMPLETE WITH A FULL SERVICE HISTORY UP TO 05/03/2018 @ 57310 MILES 9 THE FIRST THREE SERVICES WERE CARRIED OUT BY NISSAN MAIN DEALER & THE REST WERE DONE BY NON FRANCHISE GARAGES ). STANDARD SPECIFICATION ON THIS TOP OF THE RANGE MODEL INCLUDE COLOUR SATELLITE NAVIGATION, BLUETOOTH CONNECTIVITY, REVERSE CAMERA, FULL PANORAMIC GLASS ROOF, 18 INCH V-STYLE 5-SPOKE ALLOY WHEELS, HEATED FRONT SEATS, CRUISE CONTROL, DUAL ZONE CLIMATE CONTROL, ELECTRIC WINDOWS, ELECTRIC FOLDING MIRRORS, LEATHER 3-SPOKE MULTI-FUNCTION STEERING WHEEL, CENTRE ARMREST, AUX PORT, USB PORT, REAR PRIVACY GLASS, ROOF RAILS, SPACE SAVER SPARE WHEEL & IT HAS TWO SETS OF REMOTE KEY FOBS. 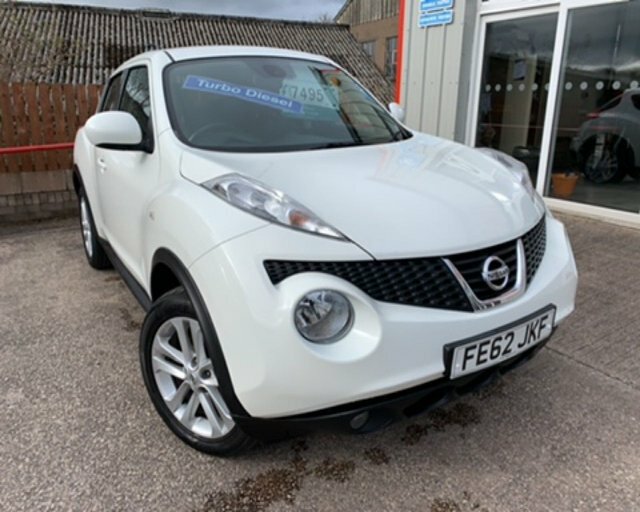 2012 62 NISSIAN JUKE DCI TEKNA 5 DOOR 110 BHP FINISHED IN PEARL WHITE METALLIC WHICH IS COMPLIMENTED WITH FULL BLACK LEATHER TRIM . THIS CAR COMES WITH A FULL SERVICE HISTORY AND DRIVES SUPERB. FEATURES THAT COME ON THE TEKNA MODEL INCLUDES AIR CONDITIONING, AUTO CLIMATE CONTROL, HEATED FRONT SEATS,AUTOMATIC WIPERS, BLUE TOOTH HANDS FREE CONNECTIVITY, PRIVACY GLASS, SAT NAV, REVERSING CAMERA, AND FULL LEATHER TRIM. CALL US TODAY ON 01768840111 TO ARRANGE A TEST DRIVE AND VIEWING WE OFFER EXCELLENT P/X PRICES AND FINANCE PACKAGES TO SUIT EVERY BUDGET. 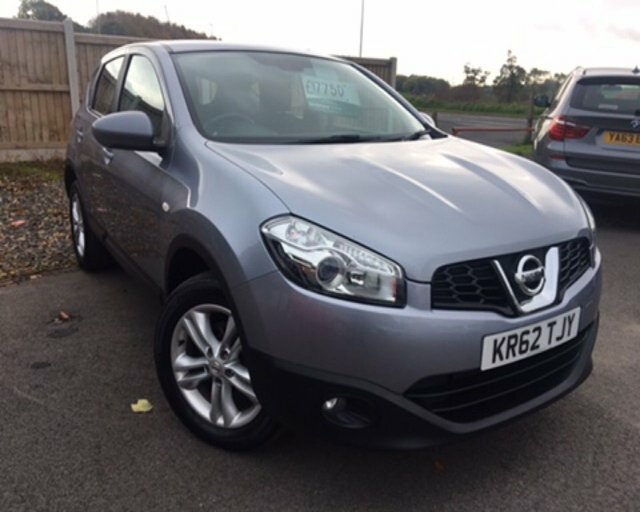 2012 62 NISSAN QASHQAI 1.5 ACENTA DCI 5 DOOR 110 BHP FINISHED IN GUN METAL SILVER WHICH IS COMPLEMENTED WITH BLACK CLOTH INTERIOR. STANDARD FEATURES THAT COME WITH THE ACENTA MODEL INCLUDE BLUE TOOTH HANDS FREE CONNECTIVITY, DUAL CLIMATE CONTROL, FULL COLOUR SCREEN SAT NAV, LEATHER CLAD MULTI FUNCTION STEERING WHEEL, FRONT AND REAR ELECTRIC WINDOWS, REVERSE CAMERA,CRUISE CONTROL, AND A 6 SPEED GEAR BOX. CALL US TODAY ON 01228599900 TO ARRANGE A TEST DRIVE AND VIEWING WE OFFER EXCELLENT P/X PRICES AND FINANCE PACKAGES TAYLOR MADE TO SUIT EVERY BUDGET. If you're looking for a fun city car, a spacious family hatchback, a sporty crossover or a serious off-roader, Nissan is a manufacturer worth serious consideration. The Nissan Micra is a class-leading supermini, while the firm's Juke model set the standard for crossover vehicles. Browse the complete range of used Nissan cars for sale in Penrith here on our website and let a member of our team help you find a great deal on your next pre-owned vehicle. Here at Intercars of Penrith Ltd we have a reputation for supplying quality used cars at affordable prices and we ensure that every vehicle is thoroughly tested before going on sale. Start the search for your used Nissan today.